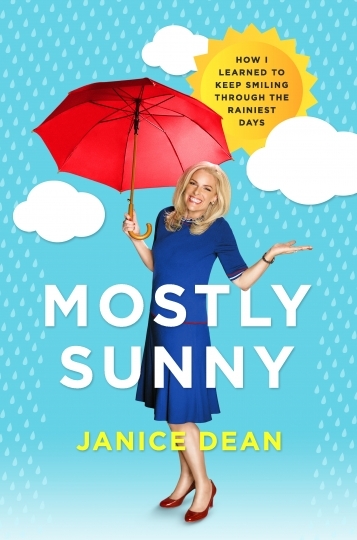 Book review: In her book "Mostly Sunny," readers get an honest, inside look at TV meteorologist Janice Dean's life outside the spotlight. Most people may recognize Janice Dean as the morning meteorologist on "Fox and Friends." Her bubbly personality and willingness to partake in any and all food segments makes her a crowd favorite. But there is so much more to Dean than what we see on television. Dean began her career in Canada, where she worked at a classic rock radio station. After a short stint in Houston, Dean accepted a position with "Imus in the Morning," becoming the news editor and entertainment reporter for the long-running New York-based radio program. In 2004, Dean joined the Fox News Channel as a daytime weather reporter. A year later, she went back to school for credits to apply for the American Meteorological Society's "seal of approval" and has been in front of the green screen to this day. Dean also shares her battle with MS. She chronicles her life from the moment she found out she had the disease, to the trepidation she felt when admitting the news to Fox management. It's clear that Dean has definitely chosen to see the silver lining in what others may consider a pretty dark storm cloud. With the help of amazing medical professionals, modern medicine, and the support of family and friends, Dean is tackling the disease one day at a time with high doses of positivity. And viewers notice.